Hi @brenty - the page I have the most trouble with is at this URL: https://ibanking.banksa.com.au/ibank/loginPage.action - it's poorly built which makes things harder. The primary issue is that because there are two "password" fields, the internet password gets placed in the "Security Number" field, leaving the "Password" field blank. When submitting on this form, the 1Password extension updates (after clicking "update") the "password" field to the "security number" field - and just ignores the "Internet Password" field altogether. This has been happening on and off for years. I thought it had been fixed, but recently we've started experiencing this issue again. Because registration form is on the same page than login. So I think I've made the error to save the login and pwd when registering and now when I use 1password app to auto-fill, it completes the fields in the registration form. That could be the case @Baski, but it could also be a field labeling issue. 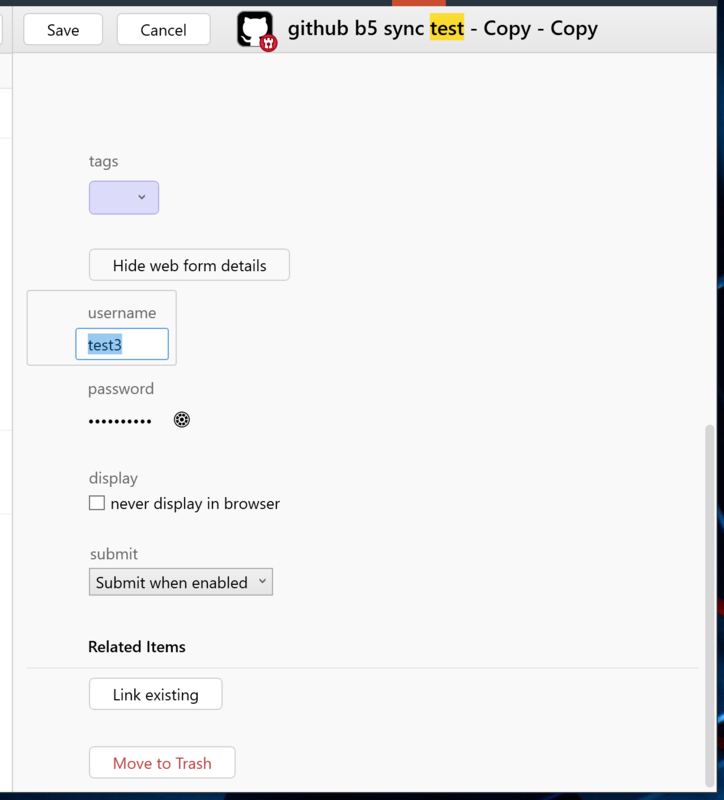 If it is the web form details, though, following the steps Brenty outlined above to fill in the sign-in form and save a new Login should correct it. Give it a go and let me know if it helps. But I had to try 2 times because it seems the password field is emptied each time it's focused. So at first try 1password saved my login without any password (I had put my password but the field was emptied just after I cliked on "Save" in 1password). Yeah, I'm not sure why they do things that way. Glad you were able to work around it though. Cheers! Having recently migrated from 1Password 4, this is yet another feature which you broke or deleted in 1Password 7 for Windows. I also found it very useful (I'm a techie). In this case, I just want to change the name of a field from username to emailAddress, since VRBO changed this. BTW, I tried @brenty's January 21 work-around, but it did not work for me. I tried to use it to Save new Login > Update existing, but after completing the login in, the field name was still wrong in my existing record. I'm not sure it changed anything. Or maybe I did something wrong. BTW BTW, IMO Save new Login is misleading. It would be clearer if it read Save Login to New/Existing Record, since the dialog that pops up give a user that choice. BTW BTW BTW, I'm not sure why "new" is lowercase in the menu item title Save new Login. A year ago near the top of this thread, @bundtkate worte, "[Manually editing saved Web form details is] something we do want to introduce." In the context of a happy 1Password 4 user, that should be rewritten to: "Manually editing saved Web form details is something we do want to restore." Bottom line: Please get this working in 1Password 7 for Windows. As I mentioned above, this feature was added already. If you're not seeing it, be sure to update. But if you're having trouble with saving/filling on a specific site, be sure to let us know the URL and all other relevant details (OS, 1Password, browser, and extension version) so we can investigate. I think sometimes it is just needed to edit the name of a web-form detail or even delete one because it got captured but hinders the autocompletion from automatically sign in. And sometimes there is not the option to just recreate the item, because e.g. the password history would get lost. That allows 1Password to save the URL you want to use along with additional information about the form to fill better. But again, if there's a specific site you're having trouble with, rather than talking about hypotheticals, let us know the details so we can help, and maybe even make 1Password smarter for you and everyone else in the future. Sorry for mostly speaking hypotheticly, I only do this because I always forget where exactly I had these problems, but I will try to look on that in the future. It's certainly something we can consider as we continue to improve the app. But I have to say that it doesn't come up a lot, so it would help to know how having password history from years ago is important to your workflow. I don't have a third option (apart from keeping the existing login or making a new one) to suggest at this time, but we'll take your feedback into account along with everyone else's as we develop future versions. Specific examples are pretty important when it comes to justifying putting a bunch of work into something, especially when there are so many other somethings vying for our time and attention. Hi @brenty, you are absolutely correct. I can edit them. Thanks for putting that feature back in on the desktop apps (Windows and Mac). Often I forget to hit the Edit button before trying to make changes. Without hitting the Edit button, it seems like the field is not editable. Case closed for me. Thanks for your patience. Glad you were able to find a solution, @SoKal, and on brenty's behalf, you are most welcome. @brenty Field name in web form details should be editable, sometime this is required to make auto fill works. 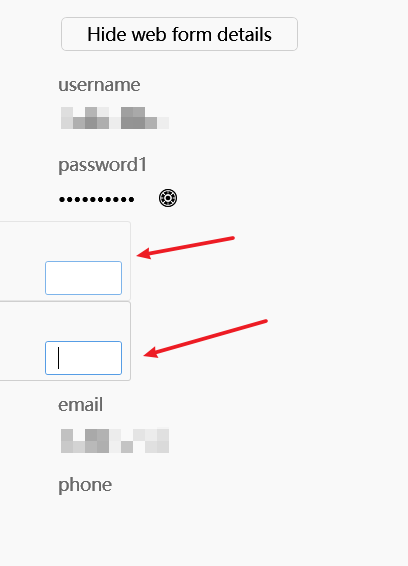 such as item saved in register page, but there are two form in login page: login and quick register, now auto fill function will always fill item to register form even i know i could fix this behavior by modify saved field name, but it's not possible in current version. The username and password fields have a specific function in 1Password, so that wouldn't have the effect you want anyway. But saving the login manually can help. If you're having trouble with a specific website we'll be happy to investigate if you'll give us the URL, to see if there's something we can do to improve 1Password. While I certainly can't speak for Brenty, @lumarel, I can say I personally never mind my time being taken up with more complex problems and I'd wager Brenty would agree. We know we have customers who range from those who would probably still own a flip phone were it a viable option these days to folks who live and breathe tech and we want 1Password to be as awesome as it can be for all of you. The more technical requests may take more time and may not all make the cut, but we still very much appreciate you sharing how we could improve your workflow, regardless of time taken. @lumarel: It's no problem at all! I just don't want to give you or anyone else reading false hope, as we're best able to help troubleshoot specific issues. Thanks for your feedback and passion for 1Password! We know we have customers who range from those who would probably still own a flip phone were it a viable option these days to folks who live and breathe tech and we want 1Password to be as awesome as it can be for all of you. So to end this, I just have to thank you one more time for your great work @bundtkate @brenty (and as well all other colleagues)! Thank you for taking the time to say so, @lumarel. It really does mean a lot, especially in a thread like this where we're asking you to hang tight on a feature that's important to you. I really appreciate your kind words and hope the whole team continues to be an asset for a long time to come. @brenty Not just username and password field in webform details, there are a lot of unused/useless field in it. Since there are edit(update) action in 1Password, why not give user ability to delete or rename a field in webform details? at least delete a field, not create a new one by copy paste four (username, password, one-time password, login url) fields. @arianelu: If there are "unused"/"useless" fields saved, that's because the webpage has those "unused"/"useless" fields in it. Not really something we have control over. 1Password just tries to save information about the page to help it with filling later. It's unlikely that any of that is doing any harm. You'll get the best results by saving a new Login on the page where you want to use it though.